"The centerpiece of a great two-channel audio system." As I was building my first serious audio system ten years ago, the single piece of equipment that elevated it from good to great was a tube preamp. Perhaps it's a matter of perception, but a decade ago, top-flight tube preamps seemed rarer and more costly. I know it took me a while to save for what I had my eye on, first a Conrad-Johnson Premier 10 and then a CAT SL1 Signature. Since that time, every preamp I've owned has used tubes. I've heard some good all-solid-state models, most notably the Simaudio P-5, but none has lured me with its sonics enough to defect. Nowadays there are many reasonably priced tubed contenders from well-known (Audio Research and Conrad-Johnson) and lesser-known (Wyetech Labs and Transcendent Audio) companies. Dave Belles has been designing audio equipment for over 25 years, first under the Belles Research name, then with OCM Technology, and now for the company that partially bears his name. I've never been quite sure if Power Modules/Belles is the entire name of the company, or Belles is part of the model designation of each product. Either way, we reviewed Dave Belles' 21A preamp late last year, and shortly after that review, in anticipation of an upcoming review of his 150A Reference amp to which I will add a sidebar, Dave Belles shipped me a 21A "just to hear." It doesn't take much arm twisting for an audiophile "just to hear" a tube preamp, especially the one I received, which incorporates an Auricap upgrade that the stock 21A we reviewed didn't have. 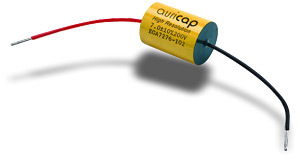 Auricap capacitors are products of Audience, the company well known for its line of audio cables and its Auric Illuminator CD treatment kit. This upgrade costs $500 USD, bringing the price of the preamp to $2995, and can't be added to an already-existing unit. Four capacitors are swapped out; Auricaps aren't cheap (some cost over $100 each), so I doubt Dave Belles is making much on the upgrade. The 21A is a single-box remote-controlled line-stage-only preamp that uses two matched pairs of 12AU7 tubes. It has higher-than-average gain, 17dB, which may cause some background hiss with high-gain amps. It has single-ended inputs, and single-ended and balanced outputs (it is not a fully balanced unit), all via heavy gold-plated connectors. The 21A's operation is smooth and intuitive -- no need to spend time discussing it -- and its look is uncomplicated and, at least in its black finish, a touch elegant. In his review of the stock 21A, John Crossett described the preamp as having "A forceful, detailed, and clear musical personality that allows you to listen deep into the sonic landscape, pulling new musical moments out of familiar material." He went on to say that "tied in with the 21As solid pace, rhythm and timing is its ease of presentation." All of this is true of the upgraded 21A as well. The Auricapped 21A sounds fundamentally neutral, but its presentation has notable bloom and, as with the very best tube preamps, the ability to portray space -- around performers and as an entity itself. Its sound is spacious. There is no tubey glaze, but also no etch or edge. Instead, there is clarity, vigor, and grace. Nobody will say the 21A is laid-back, but it doesn't sound forward either. It walks the line of perspective as few preamps do, tipping neither one way nor the other. Its performance is accomplished -- very detailed and very enjoyable. What I wasn't expecting, though, was to discover how closely the upgraded 21A comes in the overall sound quality to that of my long-term preamp of choice, Lamm's L2 Reference ($13,390). The L2 sounds a touch more gentle, less insistent, though just as clear. Through the midrange, the L2 shines, sounding pure and unadorned. Its presentation is a touch laid-back, which, for me at least, heightens involvement. The Lamm L2 draws me in and then pays off with the clarity of its presentation. Music through the L2 lures, and I never strain to hear it. However, I'm not slinging hyperbole by saying that some listeners will prefer the Auricapped 21A to the L2 -- for the former's more forceful, spacious presentation. There are always issues of matching a preamp with an amp sonically, but the upgraded 21A is neutral enough that you won't choose it to tune the sound of your system, moving it toward one sonic outcome or another. It's the hub of a fine audio system, not a component that adds one spice or another to the sonic stew. A CD that displayed the Belles and Lamm preamps' differences well was Geoff Muldaur's Private Astronomy: A Vision of Bix Beiderbecke [Edge Music B0000907-02], a collection centered around Bix Beiderbecke's solo piano music arranged for a strings-woodwinds-brass ensemble. I read about this recording on our onhifi.com site, and Wes Phillips nailed it, calling Muldaur's approach "'timeless Americana.'" Right on, Wes. Over the upgraded Belles 21A, Private Astronomy sounds brash and swinging. Martha Wainwright's voice and its brass accompaniment on "There Ain't No Sweet Man Worth the Salt of My Tears" filled the business end of my listening room. Images were bloomy and big, not larger than life but certainly larger than those cast by the L2, which sounded more composed and gentle in comparison. The L2 is easy to listen to and love, its detail never thrust into your face and its overall presentation never plagued with obvious coloration. It sounds more sophisticated than the upgraded 21A, perhaps due to its easy sound, but the 21A with Auricaps on the side is tasty nonetheless. More than anything, the upgraded Belles 21A proves that you don't have to pay five figures for a reference-level preamp. I prefer to live with the Lamm L2 Reference, even though it's not remote controlled, but the 21A is not far off the mark and less than one-quarter of the L2's price. If you covet a preamp that will be the centerpiece of a great two-channel audio system, begin your search with the Auricapped Belles 21A. Price: $2495 USD in stock form, $2995 with Auricap upgrade.